The simplest action you can take to minimize the extent of contamination is to chill your wort as quickly as feasible through this range. The good news is that homebrew wort chillers (most standard immersion chillers, counterflow chillers or plate chillers) are up to the task in most situations. Even if it takes up to an hour to get below 80 °F (27 °C), your beer is likely not going to be ruined. Still, if you shoot for a level of beer quality higher than “not ruined,” it pays to make an effort to chill as quickly as you can reasonably manage. 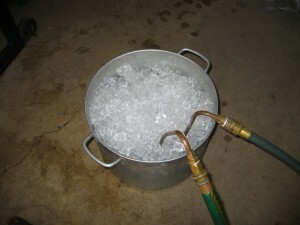 If you are cooling with an immersion chiller, swirling the chiller through the wort will speed cooling. (Wear heat resistant gloves to protect your hands from steam and the hot tubing on the side carrying cooling water away from the chiller.) If you live where groundwater temperatures are not very chilly, adding a pre-chiller — an immersion chiller sitting in an ice-water bath — can help immensely. In Texas, my groundwater can be as high as 75 °F (24 °C), so I place a pre-chiller between my water tap and the wort chiller. I chill initially with straight tap water, because the temperature difference is large enough that initial cooling proceeds quickly. 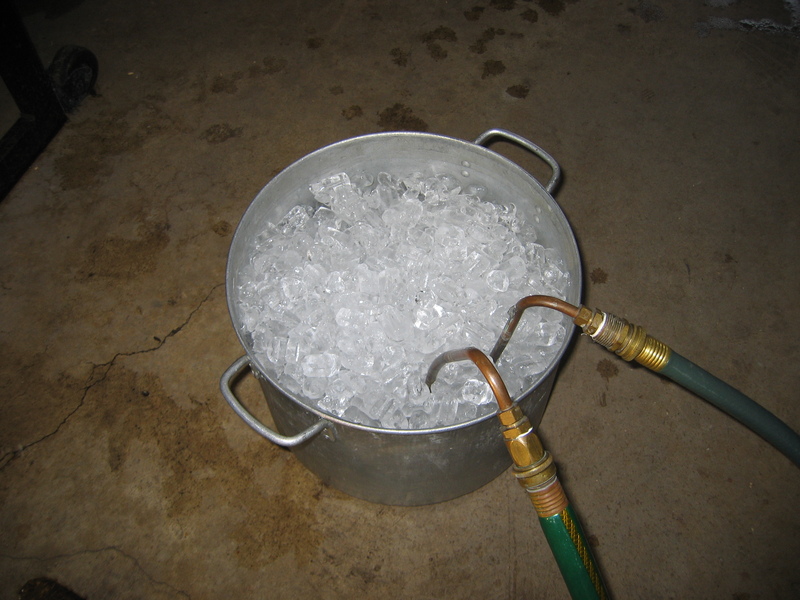 Once cooling slows, I place the pre-chiller in the ice bath to pick up the pace again. Cooling water flows through this pre-chiller before flowing through the main chiller. A pre-chiller is only needed if the temperature of your tap water is not at least 10 °F (~5 °C) below your target wort temperature. One potential drawback to covering your kettle is that condensation from the wort (potentially containing the volatile compounds DMS) will drip from the lid back into your wort. Although this is a risk, I’d rather this happen than leave my wort exposed to the open air. By the end of the boil, especially a 90-minute boil, most of the DMS is boiled off. Still, when I move the lid, I try to let the drips fall outside of the kettle. So, when chilling your wort, it pays move through the danger zone as quickly as possible and ensure that your wort is shielded from contaminants during this time. (Either ensure the inside of your counterflow or plate chiller is squeaky clean and sanitized or protect your wort from airborne contaminants when immersion chilling.) After chilling, getting the wort aerated and pitching promptly will also help minimize the impact of any wort contaminants. The only real drawback to knowing about the danger zone is that that horrible Kenny Loggin’s song will get stuck in your head. So stop thinking about it. Now. Then squeeze air out and tip upside down for a minute or two to make sure everything inside is for sure dead. Leave overnight and pitch yeast the next day…or week…or month. Some accounts of no chill cubes sitting for 6 months and still no off flavors detected. Bonus is it speeds up the brew day dramatically!!! I do no chill as well. Used to let it passively chill in the kettle, when I improvised a seal. Would pitch up to 48 hrs after, and got away with it for months until high summer temps favoured the contaminants. Now I use cubes and they are great. A wonderful side effect is the cold break in the cube, you siphon off and leave it all behind. But the best result is the kind of mis-en-place workflow I get: bottling day gets freshly pitched wort at the end, and fermenters are never empty. I’ve got a pump recirculating chiller and love it. I know many homebrewers who use a plate chiller don’t include a pump for recirculation, but this has helped me avoid the common sanitation problem with plate chillers by pumping boiling wort through it for the last 10min of the boil and back into the kettle via a whirlpool tube. 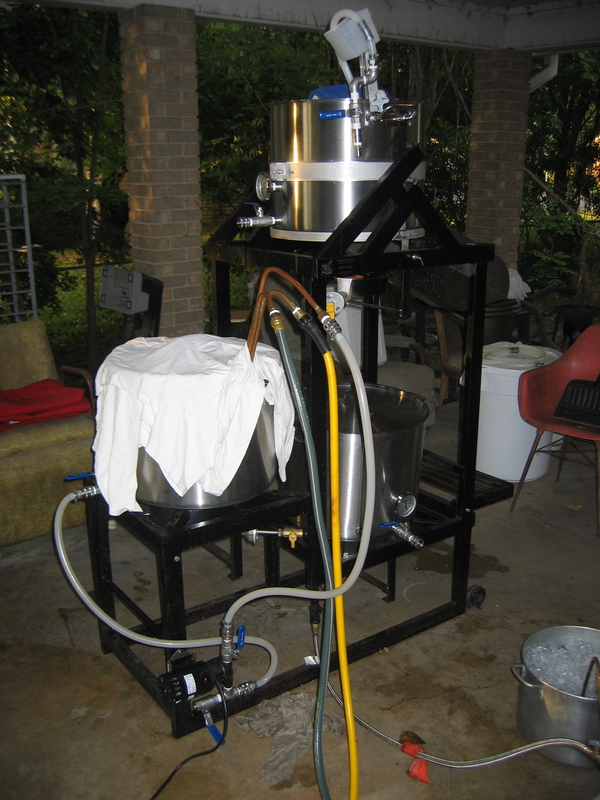 This method requires a similar setup to the Jamil-O-Chiller; so much so that I cannot see why he uses his method instead of a Blichmann Therminator or a Duda Plate Chiller. Also allows for whirlpool hopping which is very tasty. I know this is an old post but…..
Firstly “danger zone” is an awesome tune. I’ve tried covering my brew pot as I immersion chill but due to the structure of my homemade immersion chiller the lid sits very loose and doesn’t really do anything – is this why Chris uses T-shirts? Yes, I use the T-shirts to block things from getting sucked into the kettle as the wort (and the airspace above it) cools. Obviously, this wouldn’t filter out everything, but it might help (and can’t hurt). I leave the lid off during the boil and just blast it with star San 5 minutes before flameout. I pop it in once I start to chill. A lot more straightforward than trying to steam sterilise it and you’ll avoid any reduction in DMS loss.